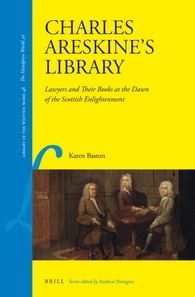 In Charles Areskine’s Library, Karen Baston uses a detailed study of an eighteenth-century Scottish advocate’s private book collection to explore key themes in the Scottish Enlightenment including secularisation, modernisation, internationalisation, and the development of legal literature in Scotland. By exploring a surviving manuscript dated 1731that lists a Scottish lawyer’s library, Karen Baston demonstrates that the books Charles Areskine owned, used in practice, and read for pleasure embedded him in the intellectual culture that expanded in early eighteenth-century Scotland. Areskine and his fellow advocates emerged as scholarly and sociable gentlemen who led their nation. 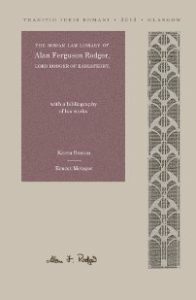 Lawyers were integral to and integrated with the Scottish society that allowed the Scottish Enlightenment to take root and flourish within Areskine’s lifetime.